Networks are a growing topic of discussion for what I’ll characterize as Risk 2.0 global challenges. Climate change is such a challenge, and has been a focus of early work by Global Solution Networks (see, for example, Addressing the Climate Crisis with Networks of the Willing and Committed). There are many explanations for why we are not acting fast enough to address climate change. The bottom line, however, is that we as communicators haven’t figured out how to make climate change sufficiently relevant to individual and societal decision-making to cause a substantial and rapid deviation from the status quo. Can we get to a low-carbon global economy? No question. But there’s a catch. Technology transformations take time – historically, decades. Today, it looks most likely that major progress toward a low-carbon economy will come only after we’ve committed to substantial and dangerous climate change. A potentially Pyrrhic victory! There are certainly plenty of willing and committed actors in the climate change space, and there is no question that building networks and networks of networks can help promote more effective action on climate change. 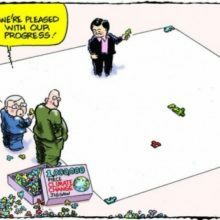 I compare solving climate change to a 1,000,000 piece jigsaw puzzle. The fact that there is so little coordination among the pieces, and that no one has a good picture of what the puzzle ultimately should look like, is a huge problem that better networking can help address. But improved networking can’t solve the key barriers of narrow professional focuses, limited personal bandwidths, different disciplinary approaches and vocabularies, and overwhelming information flows. We’re currently exploring how to make the Climate Web™ most useful and accessible to a broad range of potential users and uses. To help us figure out where to go next with the Climate Web™ we’re asking Beta users to explore the system, think about how it does or does not help advance their goals and needs, and help us figure out next steps in charting a long-term plan for the Climate Web™. We have a Guide for Beta Users available for distribution and we’ll be communicating regularly with Beta users through our Beta User Notes. If you’re interested in being a Beta User, let us know. Carla Odell’s famous knowledge management quote is: “If only we knew what we know.” What if the networks of the “willing and committed” could have access to the infinity of “what we know” when it comes to climate change, what it will take to address climate change, and what’s being done (or not done). Imagine what those networks could accomplish!